On Jan. 10, 2014, at the FUN Convention in Orlando, Heritage auctioned one of the most complete collections of large cents that has ever been assembled, which was owned by Adam Mervis. U.S. large cents were minted from 1793 to 1857. There were more than nine hundred large cents in the Mervis Collection. In terms of rarity and fame, the two greatest coins in the collection were his two “Strawberry Leaf” Large Cents, a major variety of 1793 Wreath Cents. There are just four known ‘Strawberry Leaf Cents’ and one of the two in this collection is of a unique die pairing, the words on the reverse (back) are spaced differently. One is PCGS graded “Good-04” and the ‘Strawberry Leaf Cent’ that is of a unique variety is PCGS graded “Fair-02.” For their grades, these are both surprisingly attractive coins and I was extremely excited when I first examined them in Jan. 2009. ‘Strawberry Leaf Cents’ are legends in the coin collecting community and have been avidly discussed since pictures of one of the Mervis two appeared in the first published photographic plate of coins in 1869! ‘Strawberry Leaf Cents’ are Wreath Cents. The U.S. Mint became operational in 1793 and only copper coins were struck that year, half cents and large cents. I recently devoted a three part series to the all-time most complete sets of half cents, which was also auctioned in January, though by the Goldbergs in California. 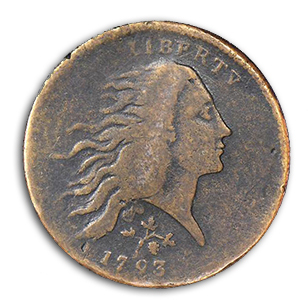 In 1793, Chain Cents, Wreath Cents and Liberty Cap Cents were minted. Liberty Cap Cents continued to be minted until 1796, though Liberty Cap Cents with a beaded border were struck only in 1793. Chain Cents and Wreath Cents are clearly one-year type coins. All Wreath Cents are dated 1793 and feature a sprig with leaves above the date. According to the Merriam-Webster dictionary, a sprig is a “small twig or stem that has leaves or flowers on it.” The name ‘Strawberry Leaf’ is misleading for two reasons. First, there are multiple leaves in the design of each Wreath Cent, not one ‘leaf.’ Second, there is not evidence that the leaves on ‘Strawberry Leaf Cents’ are supposed to be strawberry leaves. The ‘Strawberry Leaf Cent’ is mentioned without the use of the word strawberry in the April 1869 issue of the American Journal of Numismatics, a publication of the American Numismatic Society, which then had a slightly different name. An article on 1793 cents by Sylvester Crosby is illustrated with a photographic plate of various 1793 coins that was produced by Joseph Levick. This ‘plate’ is the most famous published page of pictures in the history of coin collecting. It is the first such photographic plate and it spurred enthusiasm for collecting. Moreover, it greatly helped educate people about the details of early U.S. coins. Further, many of the coins pictured were (and still are) extremely popular with collectors. Indeed, 1793 was the first year of operation of the U.S. Mint and large cents have always been one of the most popular of collecting specialties. “Its distinguishing feature is in the leaves under [Miss Liberty,] which are three trefoils or clover leaves,” Crosby said in 1869, “and the underneath the one at the right is a blossom.” This statement by Crosby was echoed by Ed Frossard, in an epic work on large cents and half cents that was published in 1879 [on p. 9]. Crosby and Frossard believed that the leaves on these are not related to strawberries. In 1897, Crosby suggested that these may be depictions of cotton leaves. Whether are not the leaves relate to strawberries, large cents of this variety will continue to be referred to as ‘Strawberry Leaf Cents.’ Importantly, this is not a variety that requires magnification to identify. A primary point is that the sprig on all other Wreath Cents is noticeably distinct from the sprig on the variety that is now known as the ‘Strawberry Leaf Cent’! The Strawberry Leaf Cent of 1793 is a readily apparent variety that tends to be listed in guides as if it is a separate date. Some large cent experts figure that it is needed for a date-set (which requires fewer coins than a die variety set) of early large cents. Only three varieties of Wreath Cents are listed, as if they are distinct dates, in the PCGS price guide and separately in the Numismedia.com price guide: Vine and Bars Edge, Lettered Edge, and Strawberry Leaf. These exact same three major varieties are the only Wreath Cents listed in the leading introductory book on U.S. coins. Curiously, during this first year, three design types of cents were minted: Chain Cents, Wreath Cents and Liberty Cap Cents. ‘Strawberry Leaf Cents’ are Wreath Cents. All Wreath Cents feature a head of Miss Liberty with flowing hair is on the obverse (front of the coin) and a distinct wreath is on the reverse (back of the coin: tail). In general, 1793 Wreath Cents are not particularly rare. More than three thousand exist, of all varieties. Strawberry Leaf 1793 Wreath Cents, however, are apparently different from typical 1793 Wreath Cents. The appeal of ‘Strawberry Leaf Cents’ extends way beyond the group of collectors who seek to complete sets of die varieties of large cents or of early large cents. Indeed, ‘Strawberry Leaf Cents’ are often considered to be subtypes, not just die varieties. Throughout the history of coin collecting in the U.S., ‘Strawberry Leaf Cents’ have been famous and highly demanded. The finest known ‘Strawberry Leaf Cent’ was formerly owned by Lorin Parmelee, who formed one of the all-time greatest collections of classic U.S. coins. He did not focus upon die varieties. Parmelee sought major rarities in gold and silver as well and and he owned many of them. As there are only four ‘Strawberry Leaf Cents’ known, and just three of these are owned by collectors, it is not surprising that large cent enthusiasts have tended, over the last century, to be willing to pay more than collectors of other series in order to obtain these. Floyd Starr previously owned the two that were in the Naftzger, Holmes and Mervis Collections. Starr is best remembered for his extremely comprehensive collection of large cents, which Stack’s auctioned in 1984. Starr had, however, a major collection of silver and gold coins in addition to his landmark set of large cents. The 1792 half disme that Starr once owned sold for $1,410,000 in the Jan. 2013 FUN Platinum Night event. I am not here discussing the ‘Strawberry Leaf Cent’ in the ANS museum, as it is not available and has not been offered in a very long time. On three of the four known ‘Strawberry Leaf Cents,’ including the ANS coin, the words of the denomination, “ONE CENT,” are placed high within the wreath on the reverse (back). These three are of the die pairing that is known as “NC-3.” The currently classified ‘non-collectible’ (NC) varieties of early large cents were, in the past, judged to be so rare that there was no point in requiring them for the completion of a set of die varieties of early large cents. In contrast, the Sheldon ‘S’ varieties are collected by many people. There are 295 ‘S’ die varieties, dating from 1793 to 1814, plus some edge varieties that are indicated with letters. (For example, S-11A has an edge that is different from that of S-11B.) The Mervis Collection contained all 295 ‘S’ varieties and eight or so related edge varieties, more than twenty ‘non-collectible’ (NC) varieties, notable die states and important errors. One reason that it is hard to complete sets of early large cents is that many rarities are in museums. The ‘Strawberry Leaf Cent’ in the ANS museum, the finest known PCGS graded VG-10 ‘Strawberry Leaf Cent’ and the PCGS graded ‘Good-04’ Starr-Naftzger-Holmes-Mervis coin are all of variety NC-3, with ‘ONE CENT’ placed high in the wreath. There is only one NC-2 ‘Strawberry Leaf Cent’ known, with ‘ONE CENT’ low or centered, depending upon how the design elements are interpreted. The low and high concepts as applied to the placement of the denomination in the wreath can be easily memorized and are, to some extent, self-explanatory. The terms ‘NC-2’ and ‘NC-3’ require a reference guide to decode and are mysterious. As an aside, I note that I am disappointed that no one adopted the easy and logical terms that I coined last year to identify Higley Coppers, which can be easily used to identify major varieties of Higley Coppers without the need to consult any reference guide. The finest known ‘Strawberry Leaf Cent’ resided in the Staples family for more than six decades, after Roscoe Staples, a collector, was killed in World War II. This cent was NGC graded ‘Fine-12’ in 2004 and it was PCGS graded ‘Very Good-10’ near the end of January 2009. Specialists in die varieties of early American copper (EAC) coins tend to grade this coin as ‘VG-07’ or ‘VG-08.’ There is a concensus, however, that it is the finest known. I refer to it as the Parmelee-Staples ‘Strawberry Leaf Cent.’ This specific coin has been famous since before the auction of Parmelee’s collection in 1890! To illustrate the variety that almost everyone now refers to as the ‘Strawberry Leaf,’ Frossard includes a picture of this specific coin in the monograph that he published in 1879. In my digital copy of this work, the pictures are a little fuzzy. I am here relying upon the interpretations of the published pictures by others, including John Krajelvich who catalogued this finest known ‘Strawberry Leaf Cent’ for ANR in 2004. In Nov. 2004, ANR auctioned this coin for $414,000, which was then considered a vast amount. Indeed, this $414,000 result was then an auction record for a large cent. The record that was broken was also set in an ANR auction, just a few months earlier. In July 2004, the Eliasberg-Jung, PCGS graded “MS-65” 1793 Chain Cent sold for $391,000. That same Eliasberg-Jung Chain Cent was auctioned by Heritage in Jan. 2012 for $1.38 million, as I then reported, a result that is the current auction record for a copper numismatic item of any kind. In Jan. 2009, Stack’s-ANR auctioned this finest known ‘Strawberry Leaf’ cent for $862,500, another record for its time. This finest known ‘Strawberry Leaf’ Cent has significant details that would correspond to a grade higher than Fine-12. It is ‘net graded’ due to corrosion in the fields. It is still an appealing coin, with mellow light brown design elements and medium to dark brown fields. There are some pleasing shades of russet toning, too. This Holmes-Mervis, Strawberry Leaf, ‘ONE CENT high’ is net graded by the PCGS as Good-04 and Bob Grellman had earlier assigned this same grade to it. In the catalogue of the Holmes ‘Early Date’ sale by the Goldbergs in Sept. 2009, Grellman notes that this ‘Strawberry Leaf Cent’ has the details of a Fine-12 grade coin. 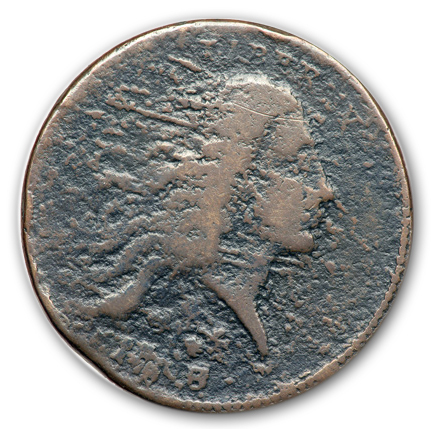 Bob emphasizes that it is “covered with moderate corrosion,” especially “on the obverse”. Grellman mentions other imperfections, including rim bumps and scratches. Despite its imperfections, which are not unusual for a 1793 cent, this is an exciting coin to view. Its color is very similar to that of the finest known Strawberry Leaf Cent. Light tan-brown design elements contrast well with medium to deep brown fields, plus there are some russet shades. Admittedly, the amount of corrosion in this coin is a little bothersome. It is difficult to appreciate the leaves and view the numerals. This coin sold for $218,500 in Sept. 2009. Greg Hannigan bought this and the other Starr-Naftzger-Holmes ‘Strawberry Leaf Cent.’ Mervis purchased both of them from Hannigan in March 2011. Although the sole surviving ‘ONE CENT low’ (NC-2) ‘Strawberry Leaf Cent’ has been regarded as unique for more than 140 years, this is not the only characteristic about it that I like. Several experts grade it as “Fair-02,” though Grellman adds a ‘plus.’ In my view, a “Fair-02+” grade is more than fair. Indeed, this coin merits a plus, a star and other accolades. For a Fair-02 grade coin, it is terrific. Although Grellman notes some “porosity,” I find this to be extremely minor. All three ‘ONE CENT high’ (NC-3) ‘Strawberry Leaf Cents’ have far more serious surface problems than does this ‘ONE CENT low’ coin. This unique ‘ONE CENT low’ (NC-2) ‘Strawberry Leaf Cent’ is characterized by wear that is smooth, even, normal and honest. Some of the imperfections in the rims were caused at the U.S. Mint. One very noticeable rim bump would probably be consistent with a grade of AG-03 or higher and is thus not a cause for concern in regards to this coin. Moreover, this coin has just a few contact marks. There are many fairly graded Fine-12 grade large cents that have more contact marks than does this coin. Also, its color is natural and very appealing. Overall, this coin is excellent for a well circulated, pre-1800 large cent. Even if the two Naftzger-Starr-Holmes-Mervis, ‘Strawberry Leaf Cents’ were of the same variety, I would rather have this one. This same coin appears in the first photographic plate of U.S. coins, which I already mentioned. This ‘Levick plate’ was published in April 1869! Crosby then referred to this specific coin as being “unique”! Now, 140 years later, it remains the only coin known of its die pairing. In 2009, this coin brought $264,500, a price that I then concluded was weak. In the same auction, the Naftzger-Holmes, PCGS graded VG-10 1795 Reeded Edge Cent sold for $1,265,000, the first large cent to be auctioned for more than one million dollars! In order to comprehend the specialness of that coin, it has to be picked up and examined with a magnifying glass. That 1795 is another Dan Holmes coin that was in the Adam Mervis Collection. On Jan. 10, 2014, the unique ‘ONE CENT low’ (NC-2) ‘Strawberry Leaf Cent’sold for $352,500, much more than the $264,500 result in Sept. 2009, though less than the $381,875 result for the “Good-04”‘ONE CENT high’ ‘Strawberry Leaf Cent’! I maintain that the Fair-02 coin should be worth substantially more than the “Good-04” Starr-Naftzger-Holmes-Mervis coin. In a technical sense, this ‘ONE CENT low’ (NC-2) ‘Strawberry Leaf Cent’ has far superior surface quality than the other three. From a logical perspective, I find the $352,500 result to be very reasonable. I have thought much about these. Indeed, I have been very curious about ‘Strawberry Leaf Cents’ since I was a kid. This entry was posted in Articles on September 21, 2014 by sflwa. The first United States copper coin to break the $1 million barrier at auction will make a return visit to the auction block in January. The 1795 Liberty Cap, Reeded Edge cent, cataloged as the Sheldon 79 die marriage in Penny Whimsy by William H. Sheldon, is the top highlight of the Adam Mervis Collection, to be offered by Heritage Auctions Jan. 9. The auction will be conducted in Orlando, Fla., in conjunction with the Florida United Numismatists Convention. The coin is graded Very Good 10 by Professional Coin Grading Service. The coin last sold Sept. 6, 2009, for $1.265 million, by Ira and Larry Goldberg Auctioneers in conjunction with McCawley-Grellman, The Copper Specialists, in the sale of the Dan Holmes Collection of Early Date Large Cents, Part I. The 2009 price realized includes a 15 percent buyer’s fee. Considered the finest known 1795 Liberty Cap, Reeded Edge cent among seven examples confirmed, the coin is one of some 1,200 lots comprising the Mervis large cent collection. The collection also boasts two of the four known varieties of 1793 Flowing Hair, Wreath, Strawberry Leaf cents. The varieties derive their name from the plant appearing below Liberty’s portrait and above the date. The Strawberry Leaf cents are classified as noncollectible varieties because they are known by three or fewer examples. Mervis assembled the bulk of his collection of large cents over a four-year period between 2007 and 2011 with the guidance of Greg Hannigan from Hannigan’s Rare Coins/U.S. Currency LLC in Royal Palm Beach, Fla. The Mervis Collection includes all 302 Sheldon die marriages that fall outside of the “noncollectible” category, according to Hannigan, who sold Mervis all the coins in his large cent collection. The Mervis/Hannigan numismatic collaboration began in 2006 when Mervis purchased from Hannigan via eBay an 1844 Coronet cent certified Mint State 65 red and brown by Numismatic Guaranty Corp.
A decisive moment in the assemblage of the Mervis Collection came with Hannigan’s placement of the winning bid in 2009 for the 1795 Liberty Cap, Reeded Edge cent, a bid that almost didn’t get placed as Mervis hesitated. 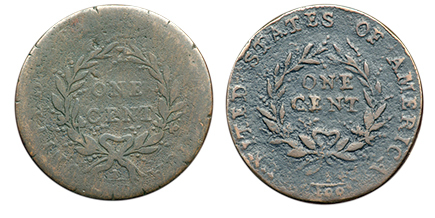 Hannigan had been provided with Mervis’ bidding limit before the lot containing the 1795 Reeded Edge cent opened. Once bidding began, it soon eclipsed Mervis’ limit. Hannigan said Mervis had wanted to acquire the coin for $900,000 or less, but Hannigan said he told Mervis that to win the coin would take $1 million or more. And it did. Mervis’ lots from the Holmes sale, for which Hannigan placed the winning bids, cost more than $2.5 million, Hannigan said. Mervis, 52, said that although he began his numismatic collecting some 40 years ago filling holes in Whitman coin folders, his interests multiplied six or seven years ago with the attention given by his then 13-year-old son, Alec. Alec has the better eye for coins, and he especially liked the early dates, Mervis said. That, coupled with the older Mervis’ meeting with Hannigan, put him on the road to aggressive pursuit of the large cents by Sheldon variety. Mervis credits Hannigan’s tenacity and enthusiasm in the effort to help him attain his collecting goals with the large cents. Next to the large cent collection assembled by Roy E. “Ted” Naftzger Jr., Hannigan considers the Mervis Collection the highest in quality among large cent collections of the 302 Sheldon die marriages to come to auction. At the 2009 Holmes auction, where he purchased the 1795 Reeded Edge cent, Hannigan also acquired the two 1793 Strawberry Leaf cents for his own collection. Hannigan didn’t decide to part with the coins until 2010, when he broached the subject with Mervis before a scheduled trip to meet Holmes at his Cleveland, Ohio, home and discuss their common zest for large cents. Hannigan said he brought the Strawberry Leaf cents with him on that trip and handed them over to Mervis. Hannigan said he provided Mervis the opportunity to consummate the deal several months later, with payment in 2011. The obverse of the Holmes/Mervis 1795 Liberty Cap, Reeded Edge cent is plated in Early American Cents, the predecessor title of Penny Whimsy. Both the obverse and reverse are illustrated in Penny Whimsy; United States Large Cents 1793-1814 by William C. Noyes; the 18th edition of Wayte Raymond’s Standard Catalog of United States Coins; United States Pattern Coins, Experimental & Trial Pieces by J. Hewitt Judd; and Walter Breen’s Complete Encyclopedia of U.S. and Colonial Coins. The coin has a reeded edge instead of the common edge device ONE HUNDRED FOR A DOLLAR. The reasoning for the reeded edge is unknown. Breen suggested the reeding was “an experiment which proved to be a needless frill, adding to the cost of manufacture without compensatory advantage.” The 1795 Reeded Edge cent is key to completing a collection of Sheldon numbered die varieties of early large cents. Sheldon divided the 1793 Flowing Hair, Wreath cents into nine varieties having sufficient extant examples for collectors to acquire and four varieties that at the time he designated as noncollectible. The NC-2 Strawberry Leaf cent, the only example of the variety known, is graded PCGS Fair 2. The NC-3 example in the Mervis Collection is certified PCGS Good 4 and is the second finest of three examples known. The NC-2 cent sold in the Holmes auction for $264,500, while the NC-3 cent brought $218,500. Discovered before 1869 by pioneer copper collector Richard Winsor, the Strawberry Leaf obverse design was initially called the “Clover Leaf.” The plant depicted on the cent below the portrait of Liberty is distinctive and quite unlike the three-leaved plants shown on the other cents of the 1793 Flowing Hair, Wreath obverse design type. No one knows specifically what plant Mint die sinker Adam Eckfeldt intended by what is now called the “Strawberry Leaf,” nor the reason why such a startling change was implemented. Collector John Meader, according to the pedigree for Mervis’ NC-2 variety, had pulled the 1793 cent from circulation in 1845. Following Winsor’s ownership of the unique variety, the coin passed through the hands of such notables as S.H. & H. Chapman; Sylvester S. Crosby, author of Early Coins in America; Chicago beer baron Virgil M. Brand; Burdette G. Johnson from St. Louis Stamp & Coin Co.; Dayton, Ohio, dealer James Kelly; collectors Floyd E. Starr and Roy E. “Ted” Naftzger Jr.; and New York dealer Tony Terranova, who placed the coin with Holmes Oct. 16, 1995. The first example of an NC-3 1793 Strawberry Leaf cent is reported to have been discovered in the 1940s by William Rabin. The Vine and Bars edge device found on NC-2 and NC-3 cents also appears on Sheldon varieties for 1793 designated S-5, S-6, S-7, S-10, S-11a, NC-4 and NC-5. The same edge device appears on the NC-3 1793 Strawberry Leaf cent in the collection of the American Numismatic Society. In October 2004, six large cent specialists — Holmes, John Kraljevich, Wes Rasmussen, Walter Husak, Jeff Gresser and Al Boka — examined the ANS NC-3 cent and determined the edge device matched those of Holmes’ NC-2 and NC-3 coins. The edge device provided researchers with sufficient evidence that all of the Strawberry Leaf cents were struck at the Philadelphia Mint at or near the time of the aforementioned Sheldon Vine and Bars Edge varieties. Additional detailed information on the Strawberry Leaf cents can be found in the March 2005 issue of Penny-Wise, published by Early American Coppers. Hannigan said he and Mervis were excited about being able to assemble such a collection of large cents in such a short period of time, joining the ranks of legendary large cent collector and Kentucky distiller Robinson S. Brown, who assembled a Sheldon variety set — twice. 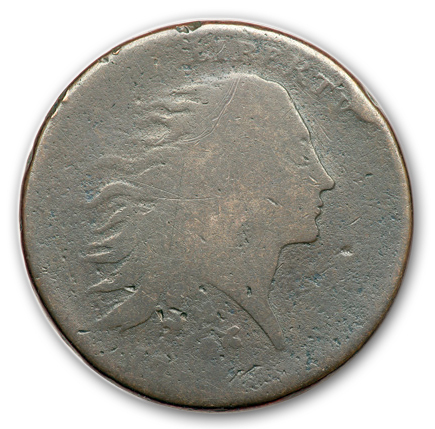 Only the third known example of the NC-11 variety of the 1794 Liberty Cap, Head of 1794 cent was cherrypicked from a dealer’s inventory Sept. 19 during the Whitman Coin & Collectibles Philadelphia Expo. The NC designation in the catalog number refers to “noncollectible,” an attribution superlative that William H. Sheldon first used in his 1949 reference, Early American Cents, and again in the 1958 and 1976 editions of the same book, retitled Penny Whimsy. The NC designation was assigned to large cent varieties for which three or fewer examples were known. The NC-11 variety of 1794 Liberty Cap cent is not listed in any of Sheldon’s references, since the first example wasn’t discovered until 1995. Sheldon died in 1977. The NC-11 variety is a marriage of two known dies; the variety’s distinctiveness is a result of the die pairing. The NC-11 die marriage was struck with the Sheldon 25 obverse and the Sheldon 32 (“Broken Leaves”) reverse, according to the 2000 edition of Walter Breen’s Encyclopedia of Early United States Cents 1793-1814, edited by Mark Borckardt. Waverly, N.Y., dealer Christopher Young said he identified the now third confirmed example of the NC-11 variety of 1794 cent while combing through large cents at the bourse table of a dealer whose identity he declined to disclose. Young said he carefully examined the fine details of the cent he plucked from the dealer’s inventory to ascertain whether it was, in fact, another NC-11 example. Young said he obtained the attention of his older brother, James F. Young Jr., who was looking through coins at a nearby bourse table, to confirm his suspicions about the variety identification. James F. Young confirmed his brother’s hunch that another NC-11 cent had been found in Philadelphia, bringing the total number publicly known to three. The Young brothers have both been professional numismatists for more than three decades. Large cent specialist Greg Hannigan from Hannigan’s Rare Coins / U.S. Currency LLC in Royal Palm Beach, Fla., carried Chris Young’s NC-11 cent from the Whitman Expo to the Long Beach Coin, Stamp & Sports Collectible Expo held Sept. 26 to 28 in Long Beach, Calif., to have the coin certified and encapsulated by Professional Coin Grading Service. The coin was graded PCGS Genuine, Rim Damage, Good Details. James F. Young had a previous encounter with an NC-11 1794 cent, locating the second example known on Nov. 30, 1997, after purchasing the coin unattributed. The Breen reference identifies the condition of the example that James F. Young Jr. obtained in 1997 as About Good 3, having the sharpness of Good 5, but with a punch mark on the obverse and reverse and some small edge dents. The first example of the NC-11 variety, which is attributed as the discovery piece, was identified March 30, 1995, by New Hampshire collector James H. Young, who is no relation to the other two Youngs. Collector Harry Leifer had acquired the 1794 cent circa 1950 from an unknown individual at Leifer’s grocery store in Ossining, N.Y., in payment of goods. Upon Leifer’s death in 1991, the coin passed on to his son, Bret Leifer, who waited four years before seeking the coin’s attribution by James H. Young, who identified it a a previously unknown die marriage. Bret Leifer sold the discovery coin for an undisclosed sum to renowned large cent collector Robinson S. Brown Jr.
Superior Stamp & Coin Co. sold the discovery NC-11 coin at auction Jan. 27, 1996, for $23,100 as part of the Brown Collection. The coin went into the large cent collection of Daniel W. Holmes Jr. The coin brought $26,450 when it was sold Sept. 6, 2009, in Part 1 of the sale of Holmes Collection by Ira & Larry Goldberg Auctioneers in conjunction with McCawley and Grellman, The Copper Specialists. Hannigan has previously owned the first two examples of the NC-11 1794 Liberty Cap cent discovered. He was responsible for placing the Holmes piece into the large cent collection of Adam Mervis. The Mervis Collection, including the former Holmes NC-11 cent, will cross the auction block in January when Heritage Auctions offers the collection in its sale held in conjunction with the Florida United Numismatists convention in Orlando. This auction will be best remembered for the Philip Keller collection of colonials, which included, in addition to many other items, two hundred and seventy different varieties of Connecticut copper coins and eighty three New Jersey coppers. As I have minimal knowledge of the die varieties of colonial copper coins, I asked Greg Hannigan to comment. He actively deals in such items. Also, he has personal roots in Connecticut. As “for the auction on Thursday night, it was very busy with phone, internet and floor bidders and went very strong,” Hannigan concludes. “The floor not packed at all, mostly just the usual suspects. However, [there were] also five or six serious collectors bidding strong. The tougher variety colonial coins [in this auction] were the key varieties of Connecticuts, Fugios and New Jerseys, which brought much higher prices then we have seen in the past. Of course, there were a few exceptions,” Hannigan explains. The “key varieties” tend to be those for which there are five to twenty pieces known to exist. Some are even rarer. A 1785 Connecticut Copper with an “African Head,” lot #3179, is one of just three known. It is NGC graded Very Fine-30. I will not attempt to explain the pair of dies that were used to strike this coin. Hannigan’s “guess was it was going to sell for $80,000 or so, which [would have been] strong. It could have sold for $45,000. But, it opened at about $55,000 and sold for $115,000,” Hannigan observed. Hannigan mentions three specific Connecticut coppers for which four to twelve are known to exist. “All three [are] very rare and went very strong,” Hannigan asserts. One, lot #3188, is a 1787 Connecticut Copper with a small head that is facing to the right and has a particular variation of the standard lettering on the reverse (back of the coin). The NGC determined that it does not merit a numerical grade and has ‘Good’ level “details.” Heritage cataloguer Mark Borckardt grades it as Good-04, in accordance with the standards of early copper specialists, and Hannigan agrees with this Good-04 grade. It is not a coin of tremendous quality. Hannigan was surprised that it “sold for almost $10,000”! The next Connecticut Copper that Hannigan cites, sold as lot #3197, is said to be corroded and is certified by the NGC as having the details of a Good grade coin. Borckardt grades it as Almost Good-03. It realized $4600, many multiples of the price of a similar coin of a relatively common variety. The Keller collection is just too extensive to discuss in just a few paragraphs. I am glad that Greg Hannigan provided a few examples of rare and interesting Connecticut Coppers that realized surprisingly high prices. Also, there were a wide variety of colonial and U.S. coins in this auction. It was my intention here to discuss a few that are unusually interesting.